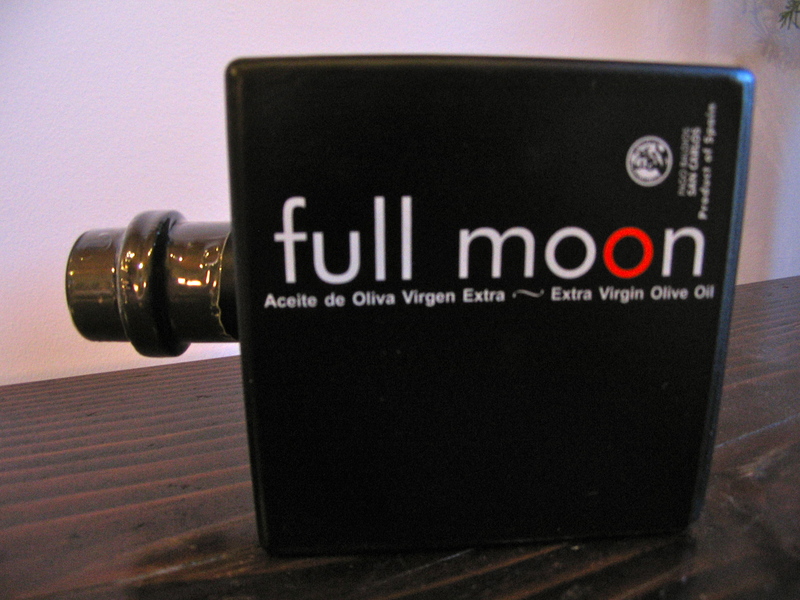 As the Earth aligns itself tonight between the full moon and the sun, I’ll be doing the same but between some wine and slices of Manchego cheese drizzled with another full moon…an EVOO (extra virgin olive oil) from a region of Spain that is dear to my heart: Extremadura. My good friend, Lupe, hails from there. I have visited it several times and enjoyed its many cultural treasures, edible and otherwise. I was first taken by the name, as most gourmet olive oils drown themselves out in over-descriptiveness or rely mainly on packaging wizardry to close the deal. However, all I needed to know was that the magic stemmed from arbequina olives (my favorite), which are supposedly picked during the full moon of October…hence the name. I also love the unusual bottle. No, it’s not round, but the short and stout shape does remind me of a circle and won’t easily tip over or block anyone’s view on a table. Hello, moon!